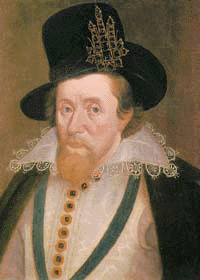 He was James VI of Scotland. When Elizabeth I died without an heir, James became king of England. He was James I of England, the first Stuart king. He was king between 1603 - 1625. James married Anne of Denmark. He spent £20,000 on his coronation (that was a lot of money in those days). The country was not very rich, so to make money, he sold titles (like Duke, Earl) for £1,000 each. He ended the conflict in Spain in 1604. The Catholics attempted to blow James and Parliament up in 1605. This is known as the 'Gunpowder Plot'. We remember it today on bonfire night.